There are only a few things I love more than a theme party. Especially when it gives me an excuse to dress up in something festive. 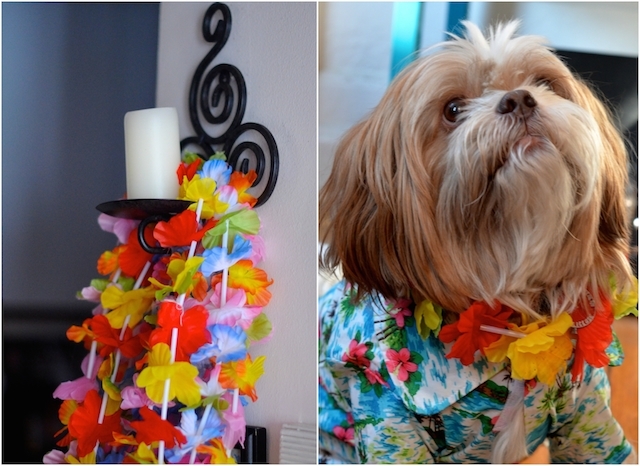 This year, I got my friends to dig out their prettiest tropical sundresses and Hawaiian shirts for some Polynesian-themed revelry at my Retro Tiki Party. 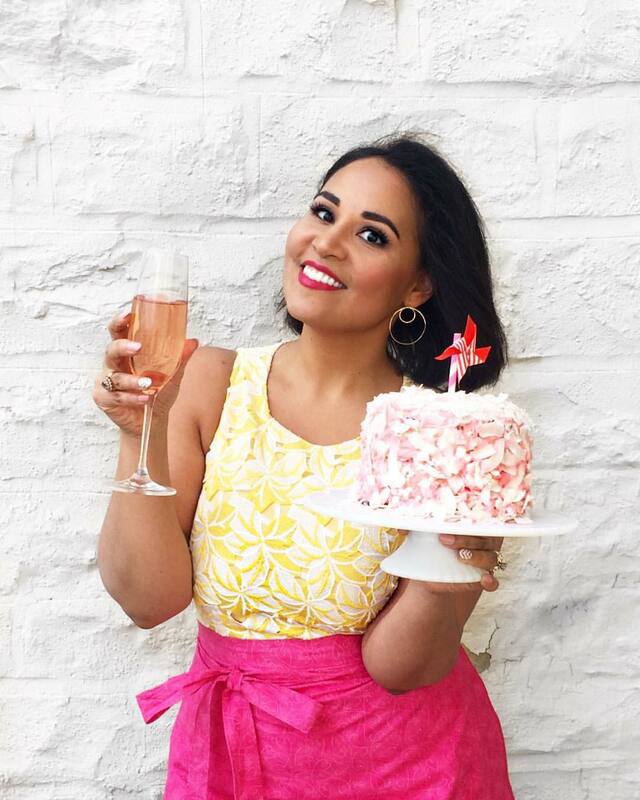 Scroll down below to see how I pulled it together, and get some inspiration for your next celebration! 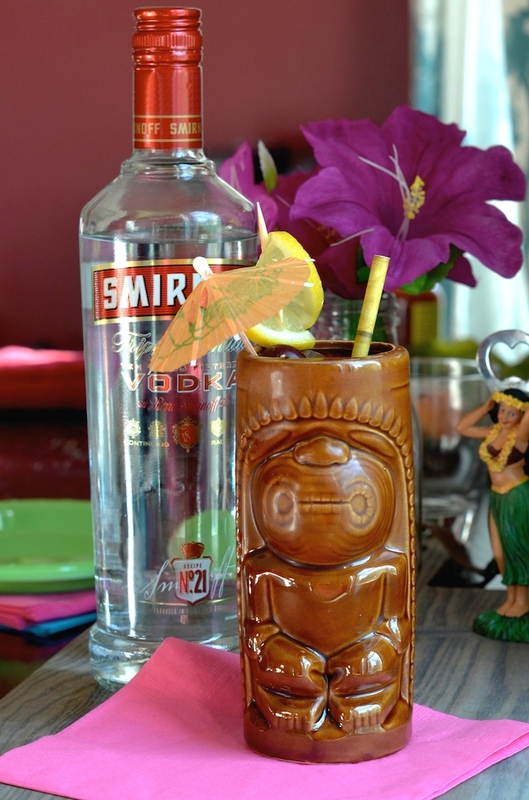 The idea to throw this party came about while brainstorming themes for my ongoing "Summer of Punch" recipe collaboration with Smirnoff this year. 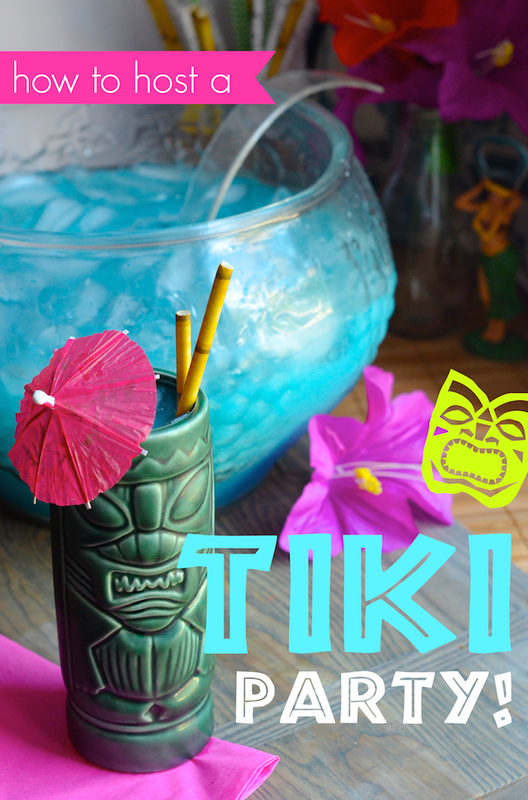 I've always wanted to throw a retro tiki-style party, and since tiki parties are all about the fun tropical punch drinks, it was a perfect match! 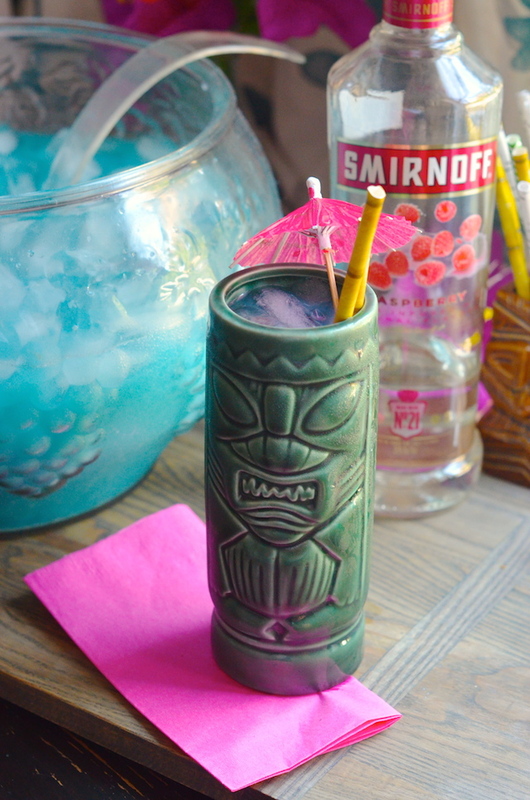 I started out by researching classic tiki cocktails. Typically made with spirits like rum, I mixed things up a bit and created vodka versions that highlighted some of my favorite Smirnoff flavors. 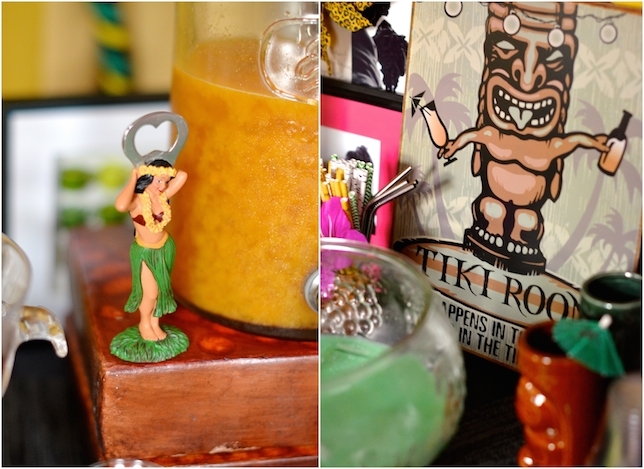 My party bar featured three updated tiki cocktail punches. 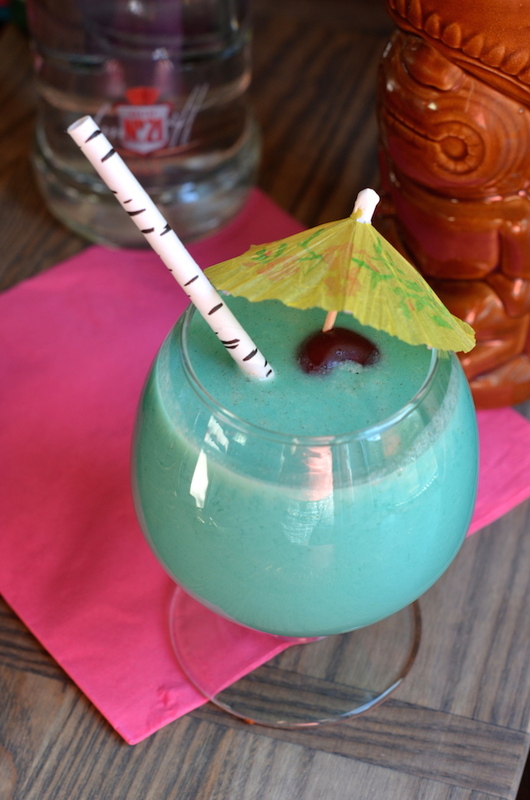 The overall favorite was definitely the Blue Raspberry Island Punch, made with Smirnoff Raspberry, cream of coconut, pineapple juice, blue curacao, and soda. I also made a Peach and Passion Fruit Mai Tai using Smirnoff Peach and a Vodka Pina Colada Punch using classic Smirnoff No. 21. I served the punches in a mix of punch bowls and beverage dispensers with cups, ice, cocktail umbrellas, and garnishes on the side for DIY serving. It's such a relaxed and low-key way to host a party because it allows guests to help themselves while I can focus on food and greeting guests. 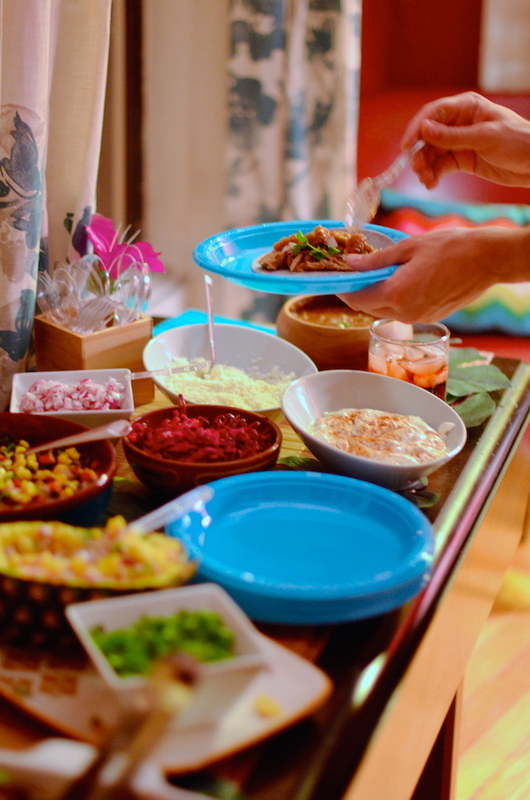 It's always smart to separate your food and drinks as it allows for more flow in your party space. This is especially important if, like me, you're entertaining in an apartment or other small space. I set my bar in my office, which is just off the main party room. I started off with a plain surface (in this case, my cleared-off desk!) and covered it with some neutral colored scarves to add texture and color. I used stacks of books and blocks to add a variety of height to the bar, and added interesting touches like a cute hula girl bottle opener and a vintage style metal Tiki bar sign I found at a discount store. Set up your punch bowls and other bar accessories ahead of time, then fill them with the beverages at the very last minute. This will save you time, and help keep the drinks cool before guests arrive. 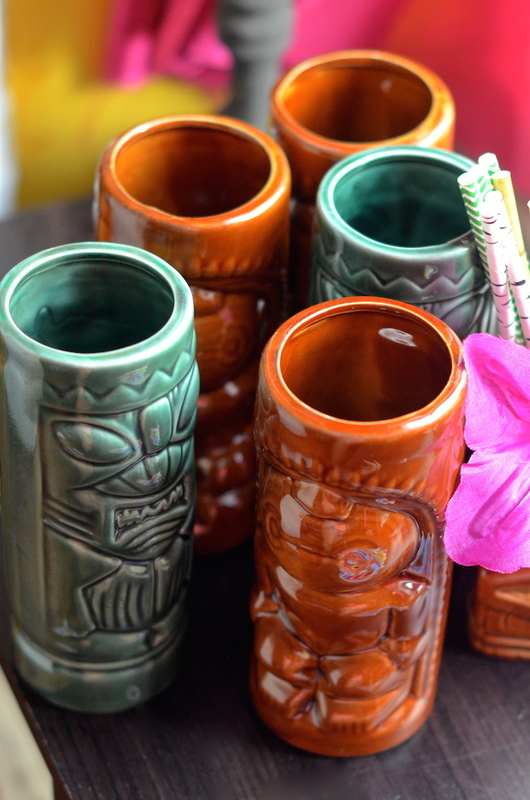 Tiki mugs are a must for any tiki party. You can find real vintage ones at thrift stores or online shops. You can also find sets of inexpensive modern reproductions at party stores. I paid about $3 to $5 each for my mugs. 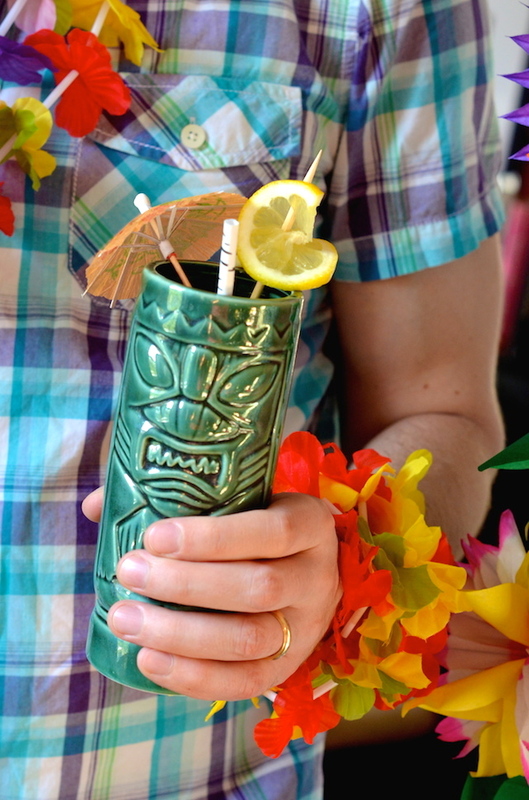 TIP: Don't feel like you need to buy one for every guest--even just a few to use as decoration (or to hold things like straws, cutlery, or cocktail stirrers) is enough to give it that classic tiki party feel! Have fun with the food, but definitely keep it simple. I decided to add a modern twist by making my party a "Tiki Taco Party." This allowed me to have a mix of fun, but easy dishes that satisfied all my guests. I broke the menu up into Polynesian or pu-pu platter style appetizers and snacks, with a DIY taco bar for the main course. I created a fun (but easy! I promise!) 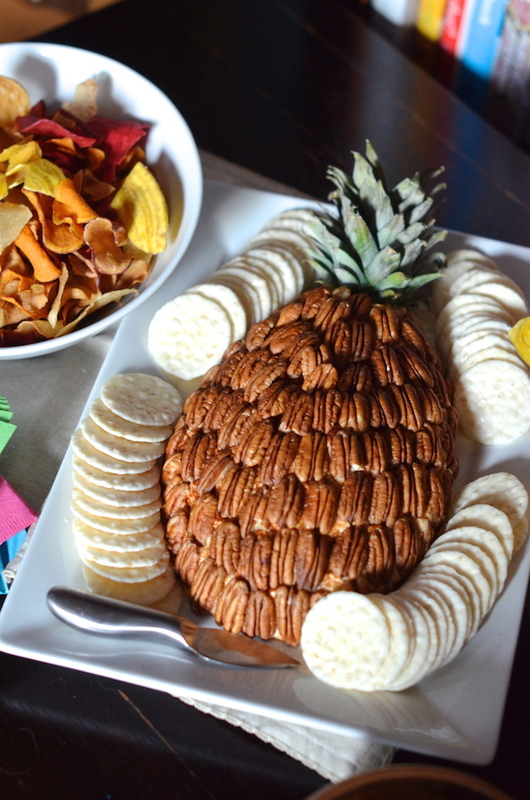 Pineapple Chutney Cheese Ball that I shaped like a pineapple and decorated with pecans and the real crown from an actual pineapple. 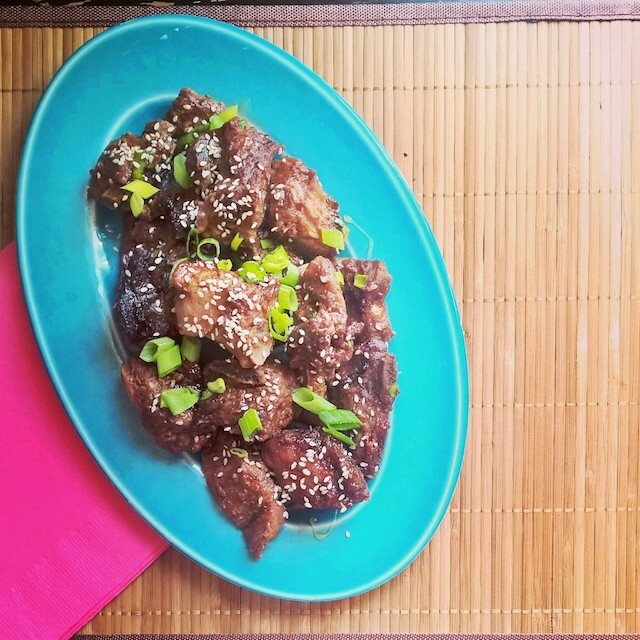 Served with plantain chips and rice crackers, it was a popular appetizer that also added to that retro, kitschy atmosphere. A couple hot appetizers that can be prepped in advance and finished just before serving are always a hit. 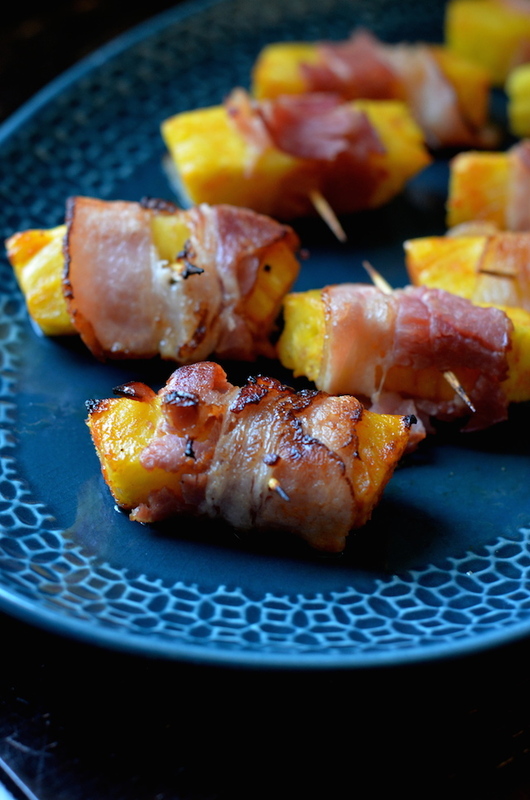 I went with simple Chinese-Style Pork Spare-Ribs and Spicy Bacon-Wrapped Pineapple Bites, which are a riff on a retro rumaki appetizer. For the DIY Taco Bar, I offered a choice of roasted and pulled pork, ancho-pomegranate brisket, and a simple black bean and corn salad, as well as blue and yellow corn tortillas. The meat was easy to prepare a few days in advance in my slow cooker and then reheated just before serving. Anytime you can do stuff in advance for a party, do it! You will be so thankful you did! 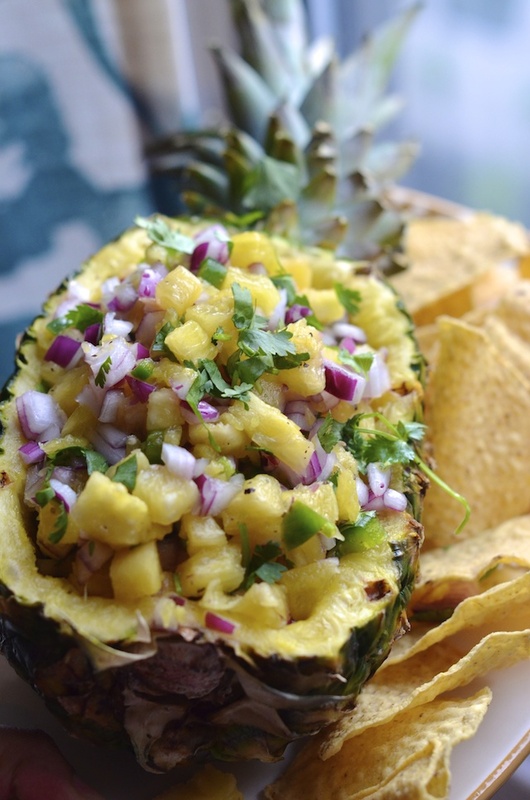 For the DIY taco bar toppings I set out bowls of my homemade restaurant-style salsa and homemade pineapple salsa (served in a pineapple bowl!). I also added some simple toppings like salted red cabbage slaw, cumin-spiced sour cream, cilantro, chopped red onions, guacamole, and cotija cheese. With a big meal like this, you don't really need a big dessert, but a little something sweet to end the night is always a good idea! 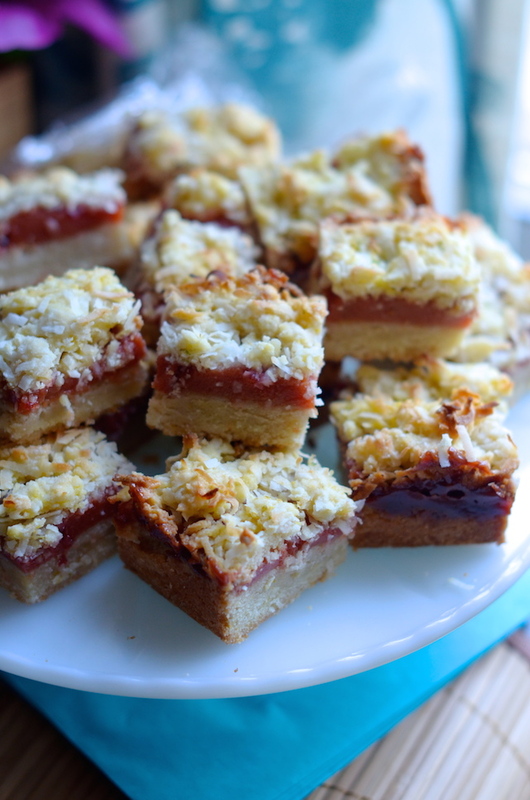 I made these easy Guava Coconut Crumb Bars and set out some additional fresh cut pineapple and watermelon for snacking. Don't feel like you have to spend a lot of money buying fancy decorations! I always recommend looking around your house for objects you already own to create the perfect party scene or tablescape. Bamboo placemats or table runners, colorful tablecloths or floral napkins can all be pulled into service for this theme. 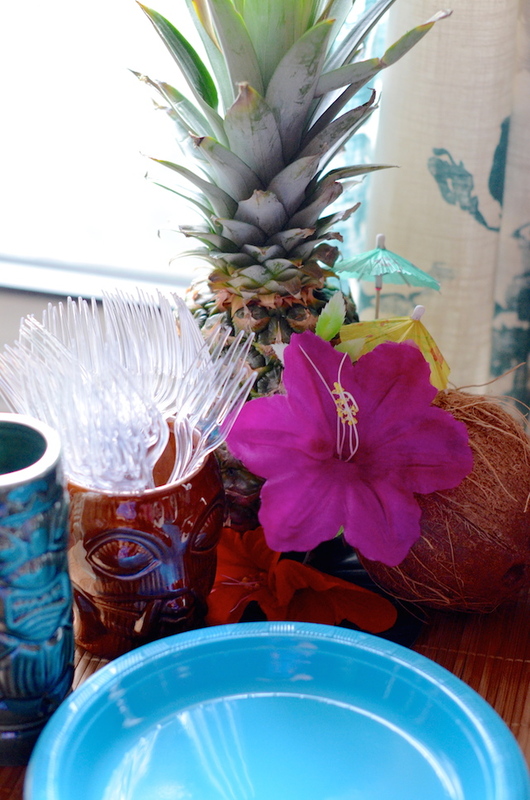 Just about any souvenir you've ever bought on an island, or beach vacation could work for this party theme. Think about things like large conch shells, sand dollars, stoneware, wooden bowls or serving pieces, or colorful scarves. If you've ever stayed in a tropical resort or hotel, you might have noticed that it always smells amazing from the minute you step inside. I like to mimic that with a sweet-smelling coconut or hibiscus candle burning in the bathroom or entryway. Such a subtle touch, but I promise you it really makes an impact. 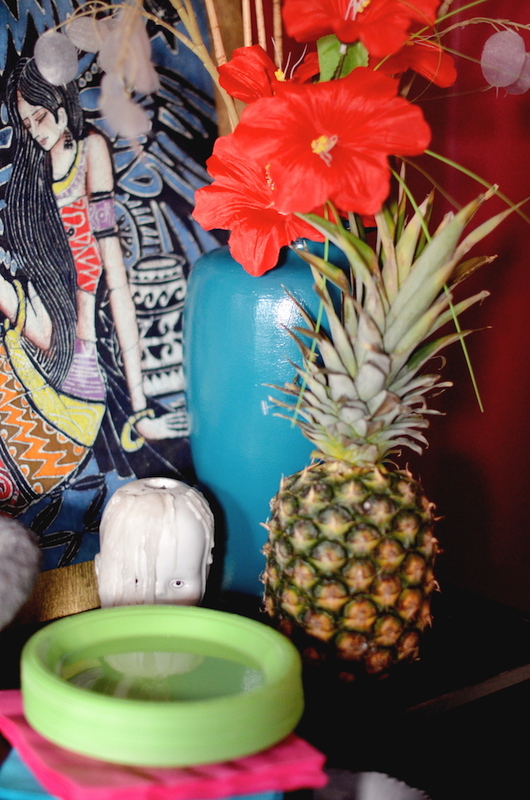 My absolute favorite decorative touch is natural tropical fruits. Pineapples, coconuts, bananas, and other tropical fruits make amazing natural and affordable decorations. I bought a few of each and scattered them around the room. The best part? You can chop them up for an amazing fruit salad (or more cocktails!) the next day. 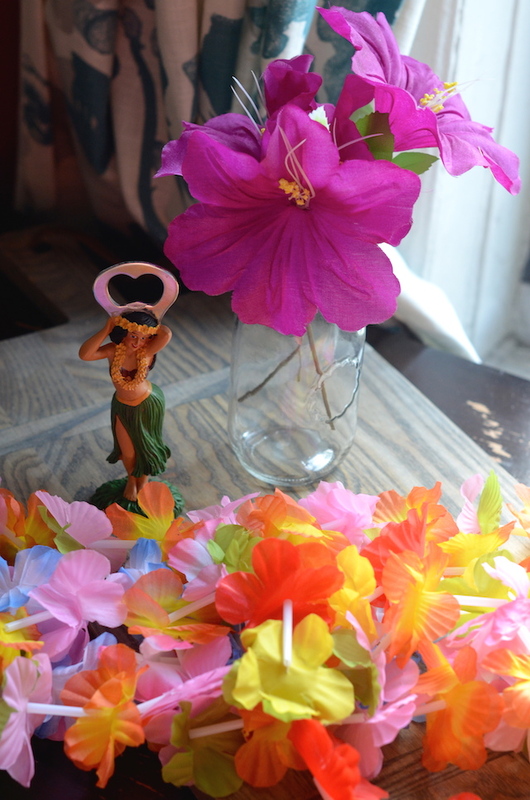 Leis and flower necklaces for your guests are a must for any tiki or Polynesian-themed party, and they're incredibly affordable. 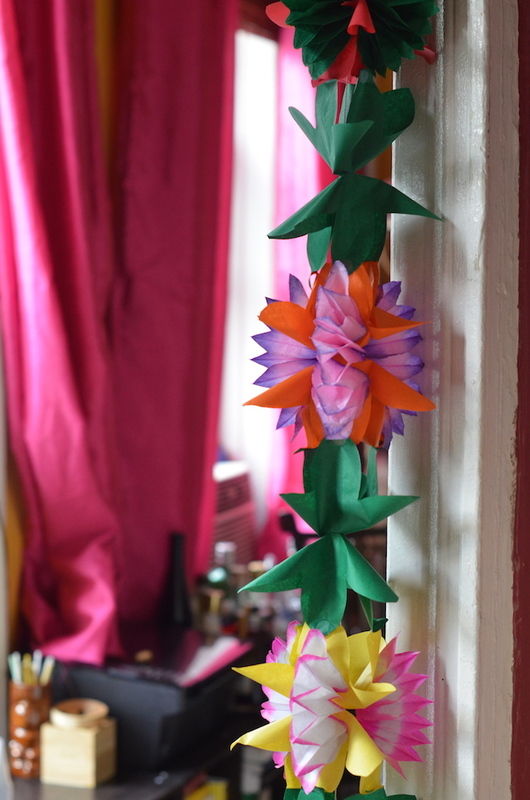 I was able to buy two dozen silk lei necklaces from a party store for about $10 and kept them by my door. I gave one to each guest as he or she arrived. I also went to a local 99-cent store and bought a few stems of silk hibiscus flowers that I cut down and used both for table decorations and to give to my guests to tuck into their hair. Finally (and possibly most important of all!) don't forget the music! 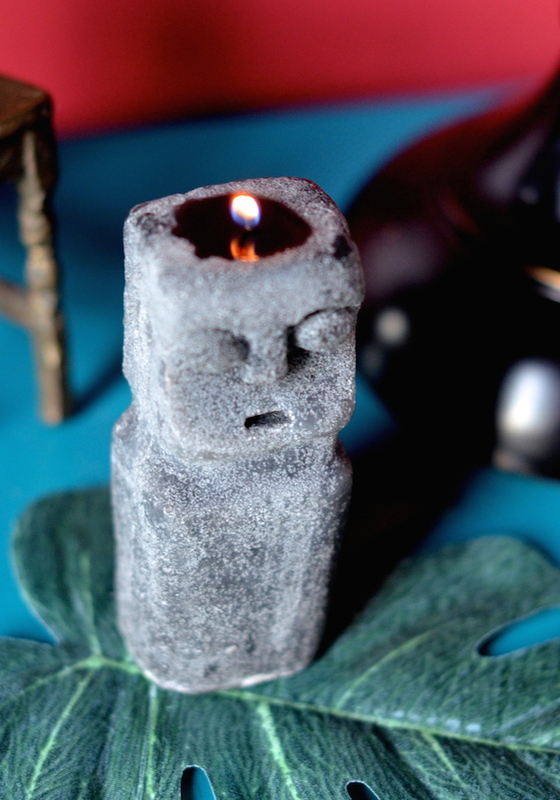 Every tiki party needs an amazing playlist. You can check out streaming sites for a premade one. 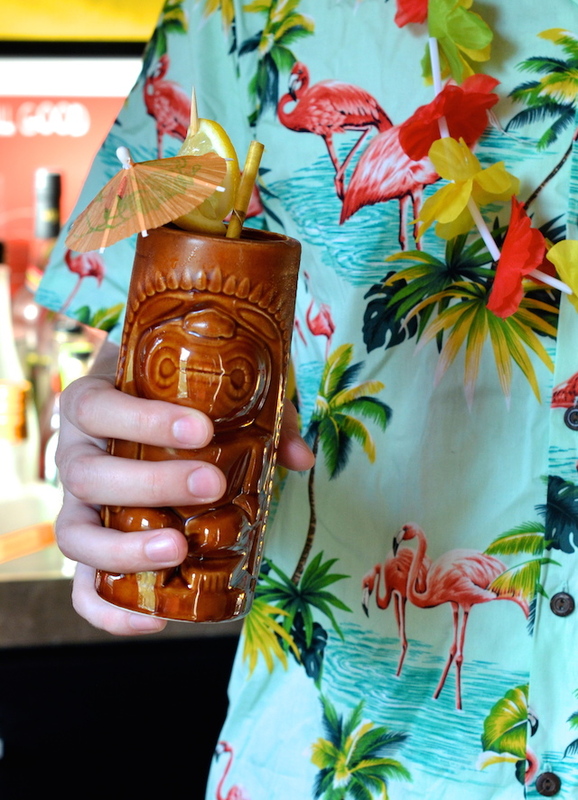 The genre of music best associated with tiki parties is called "Exotica," which is a super fun and weird mix of tropical sounds with beach and wild animal noises. Look up artists like Martin Denny for a perfect example of this. Other songs and musicians to consider include: Don Ho (of course! ), Elvis Presley (especially the soundtrack to the movie Blue Hawaii! ), Henry Mancini for great jazzy lounge music, Louis Prima's version of I Wanna Be Like You from The Jungle Book, The Beach Boys, Santo & Johnny, The Tornadoes, and The Polynesians. 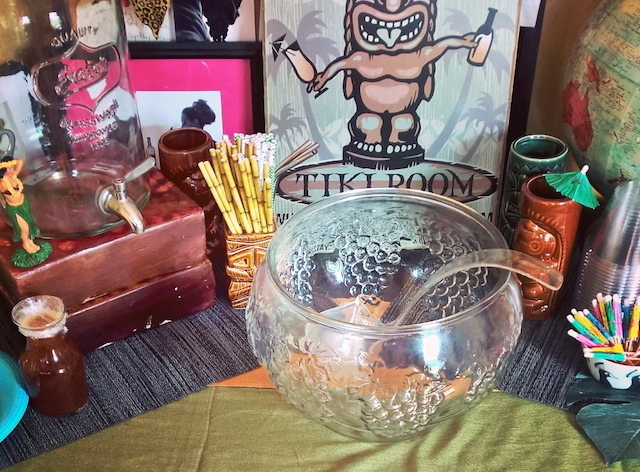 I hope that this inspires you to throw your own tiki theme party! For more fun summer cocktail recipes and ideas, follow Smirnoff and the hashtag #Punch4Everybody on Instagram and Facebook, and check out their fun party boards on Pinterest! Please remember to always drink responsibly! Whisk together all ingredients except club soda in a large punch bowl. Add 4 cups ice and top off with club soda.